Staff Sgt. Joleen Manuia and Master Sgt. 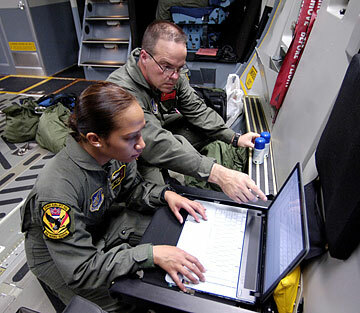 Mike Cumberland look over publications on their laptop before departing on a C-17 mission from Hickam Air Force Base. Two C-17 Globemaster cargo jets and their Hickam Air Force Base team have finished repositioning Australian Defence Force members and equipment as part of peacekeeping operations in East Timor. The Air Force-Hawaii Air Guard team with three airmen from Andersen Air Force Base in Guam moved more than 1.1 million pounds of cargo in eight days, the Air Force said this week in a statement. There are about 2,000 peacekeepers in East Timor from Australia, New Zealand, Portugal and Malaysia. The two supercargo planes are part of a new Hickam Air Force Base unit that eventually will have eight C-17 Globemasters. It is composed of members of the Air Force's 535th Airlift Squadron and the Hawaii Air Guard's 204th Airlift Squadron. The two units eventually will have eight C-17 Globemasters, with the last two arriving Wednesday and July 1. "We transported 333 passengers, 48 pallets and 74 vehicles accident-free," said Maj. Landon Henderson, director of operations for Hickam's 535th Airlift Squadron and mission commander for the Australia support operation, which ended Saturday. During the mission, C-17 crews practiced an operation where pilots leave the engines running while loadmasters get cargo on and off the aircraft, minimizing ground time. The Air Force said the operation was perfect for the shuttle missions, which moved about 20 loads of cargo from Townsville, in eastern Australia, 1,020 miles northwest to Darwin, Australia. The operation allowed crews to make two trips in a day. Staff Sgt. Joleen Manuia, former Hawaii Guard medical technician who was retrained as a 204th Airlift Squadron loadmaster, was on her first overseas mission. Manuia said she got a lot of experience with unloading while the engines were running, "which is an exciting thing for me. It gets my adrenaline pumping." The 1-year-old Gen. George C. Kenney Headquarters, also based at Hickam, was the lead agent for overseeing the planning and was responsible for command and control of the mission.